I make cuddle quilts for children who are ill. 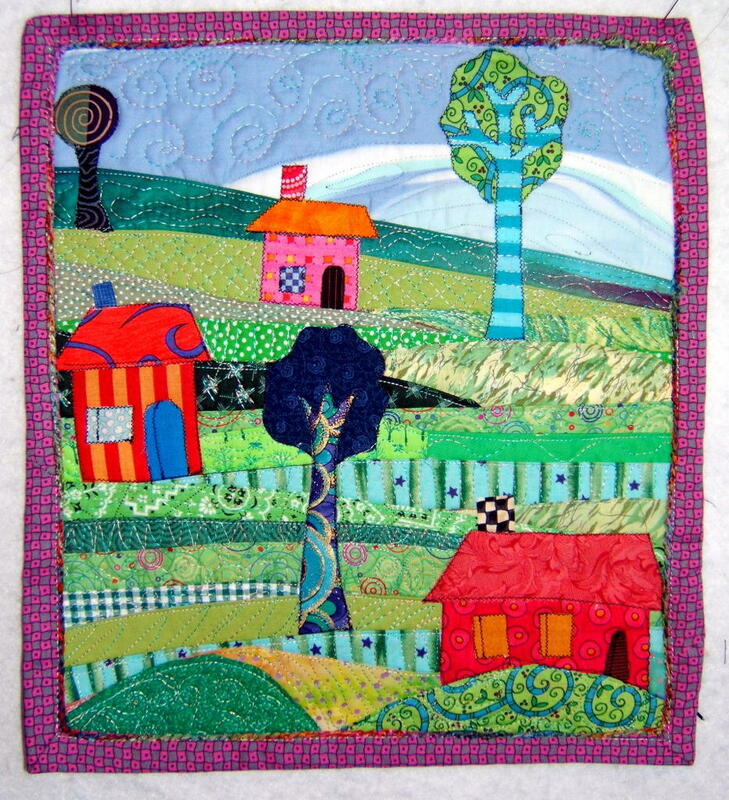 Most of them are made as my contribution to the Smoky Mountain Quilt Guild's service project of providing quilts for all the children who come to the Ronald McDonald House in Knoxville, Tennessee. 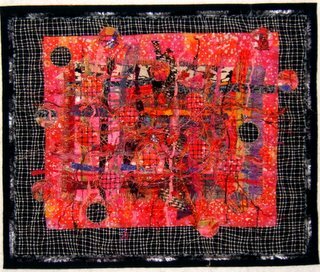 Occasionally, a friend or family member will tell me of a child in their lives who needs the comfort of one of my quilts. Such is the story of the latest one I donated. 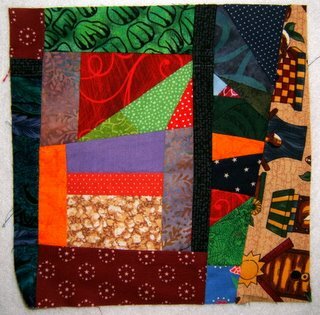 I make blocks from scrap fabrics when I'm between projects or am stuck in the process of creating one. 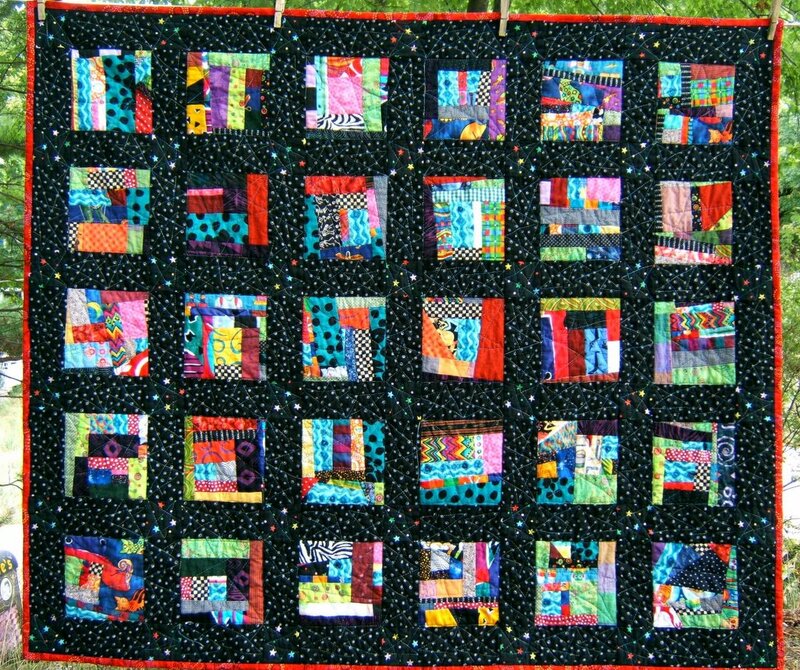 These 6" scrappy blocks are sewn out of left-over fabrics and trimmings from my other projects and those of friends who've given me what they would normally discard. They're fun to make and I like to imagine a child exploring and discovering little treasures of color and pattern ... that this would be a distraction from their pain or circumstances. 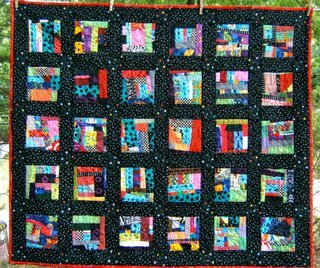 The story of this quilt began with my making up a bunch of these blocks on a Sunday in late September ... just because. Later that day my sister telephoned and said, " I know of a young boy who needs one of your quilts. He's a student of my daughter out in California." 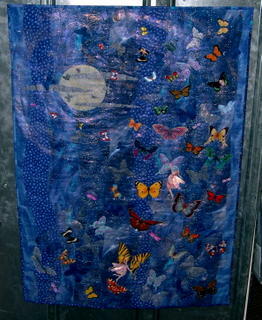 I believe in serendipity ... that I had already begun making this quilt for that particular child. I just received a thank you letter from my neice. 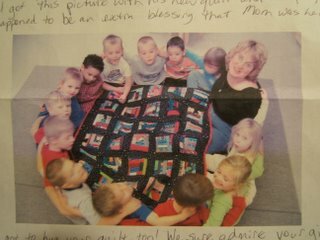 She enclosed a photo of the quilt surrounded by the classmates of the little boy who got the quilt. The children sang spiritual songs and prayed for Daniel while holding hands around the quilt. 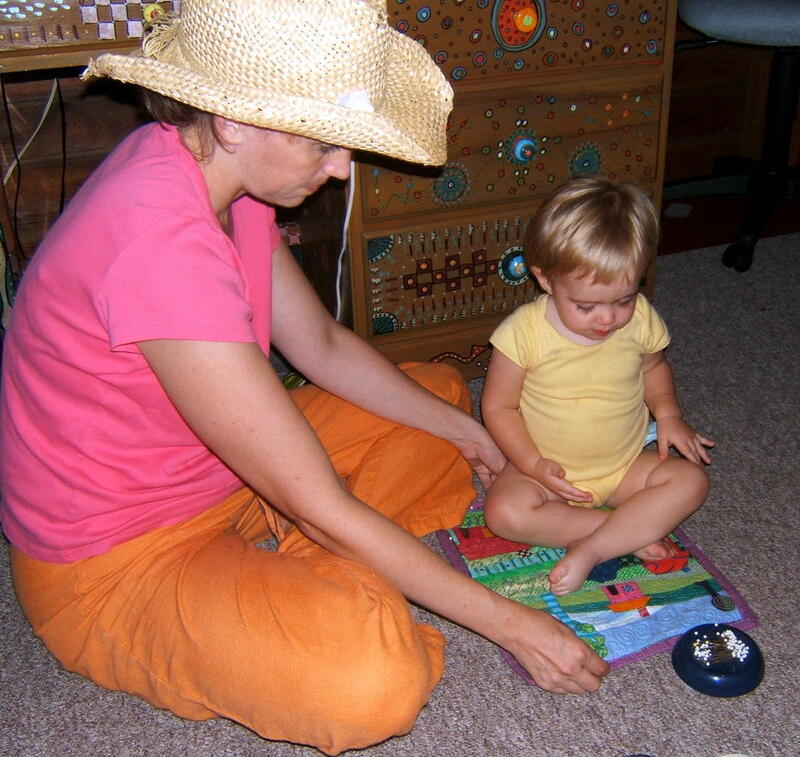 His mother wrote, "Daniel was thrilled and amazed at the stitching that went into the blanket. It came at an opportune time as he was hit by a wave of nausea and was feeling quite lousy. The blanket gave him something to cuddle up with afterward." 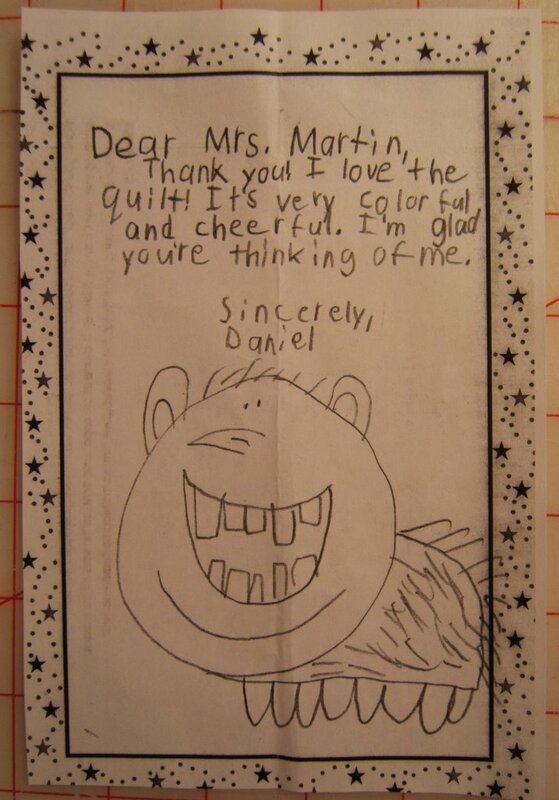 His grandmother (and day companion) wrote: "Thank you so much for thinking of Daniel and for brightening his life with this beautiful quilt. He keeps it in the living room where he spends a great amount of time and enjoys snuggling under it." 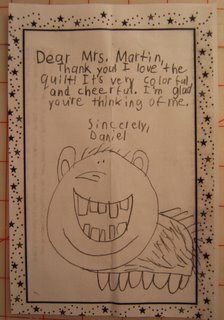 I love that picture he drew ...that big happy, toothy smile. I'm thankful that my creation has given Daniel some comfort and a bit of diversion from his illness and chemotherapy. Each quilt I make for these children is a form of prayer for me. A prayer of thankfulness for my having had healthy children and gratefulness for the good health of my grandchildren. The Renwick Gallery of Washington D.C. arranged an art and craft buying tour of the the Southeast. Knoxville was one of its destinations. Events were planned for them throughout the area. 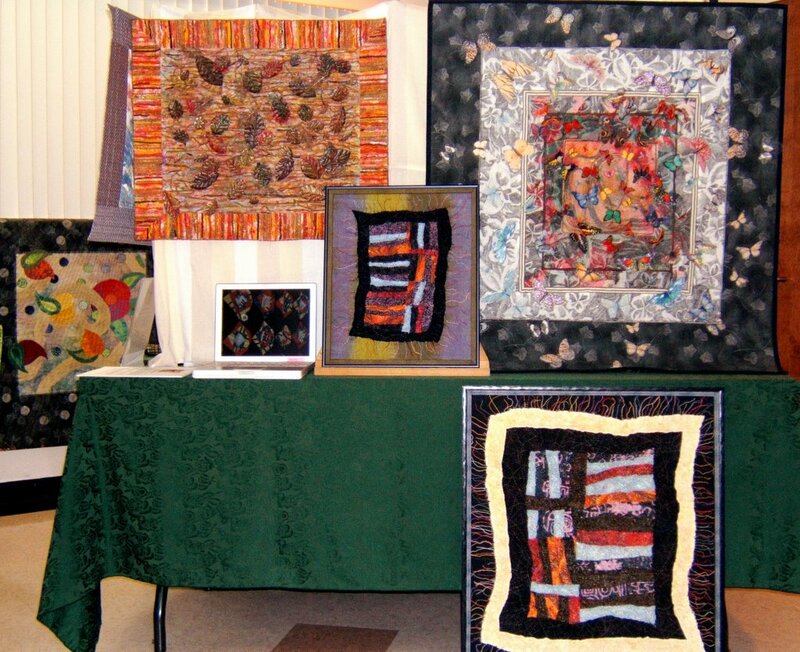 A group of ten artists and quilters from the Smoky Mountain Quilt guild set up a two hour show/sale to present work especially for the people on this tour. We each had a table plus a bit of space behind it. 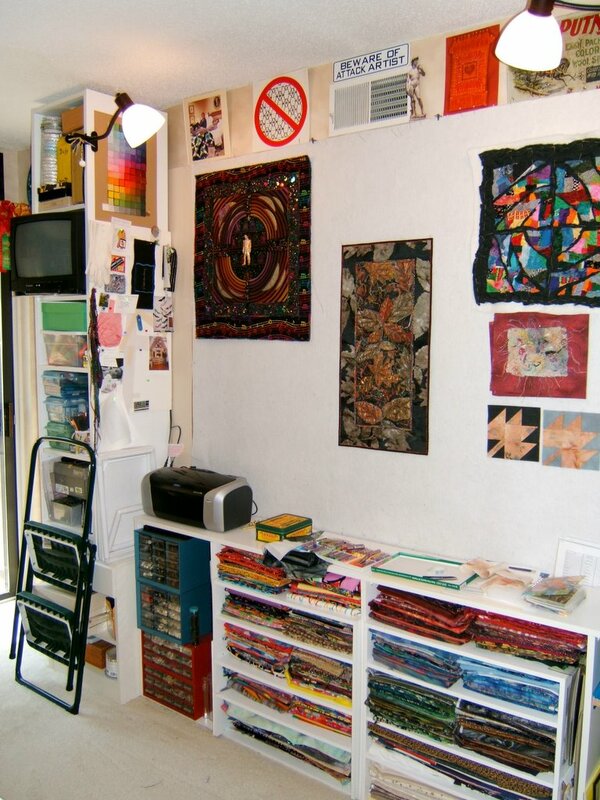 This was my set up, complete with a running slide show of a whole lot of my quilts on an iBook. Sixteen pieces were in this display. Four of them were "crinkle quilts". The rest were wall quilts that I'd made through the years ... many of them award winners of those ribbons hanging in Studio South. 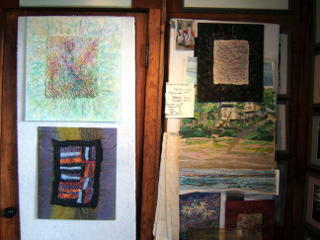 These are three of the five quilts on the back side of my display. The pink one sold. YEAH! I had printed up 4 description sheets for each of my creations. All the sheets for 3 pieces were taken for future consideration by the patrons. A future email or phone call purchase would be an even bigger YEAH. A major attraction for this event was a "bed turning" presented by Merikay Waldvogel. We had set up an old bedframe and rigged a foundation to hold a big stack of quilts. 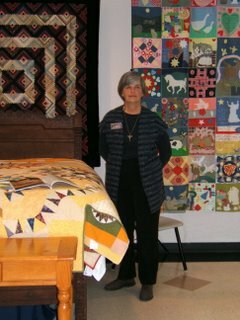 She had brought many old quilts from her collection plus several from other people as well. 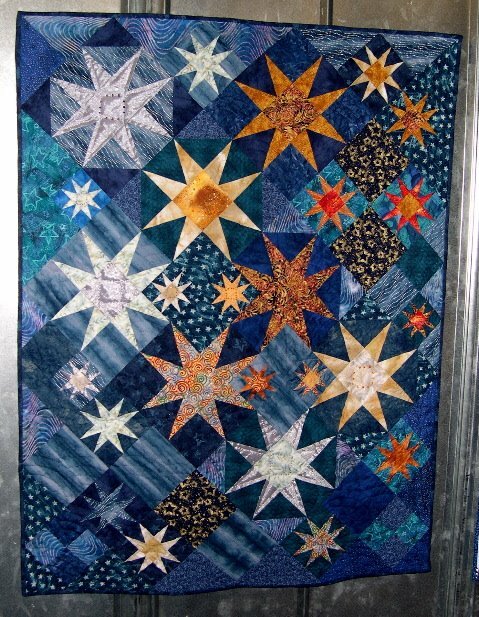 However the "turning" began with "The Sunday Quilt" which is a newer quilt that has won numerous awards and appears on the cover of a book. It was designed and made by a group called the "Out of Towners". Each of the members is a Smoky Mountain guild member and all were represented in this two hour show. Merikay narrated stories, histories, and information as she peeled back each quilt in the stack. This was a very short, but sweet event. Seven thousand dollars worth of quilts was purchased. YIPPEE YEAH! I'm back in Knoxville in the studio that's purely a working room. This 16'x12' space doesn't have to double for any other purpose. It's all mine! There are 8' patio doors on each end of the room. 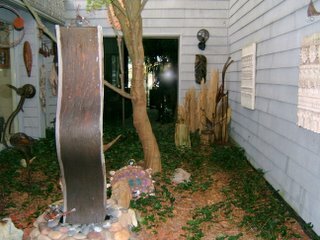 One looks into the courtyard with a 5' fountain and metal sculptures under a Maple tree. The other overlooks a landscaped grassy yard. 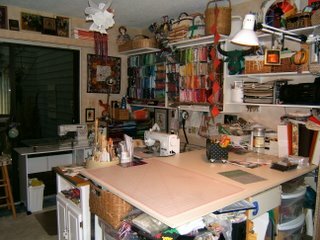 Just before we left for Michigan I finally got an additional sewing table so that both machines could be set up ... the Brother 1500s for free-motion quilting and my Pfaff Creative 7530 ... ohh, I'm glad to be back to my favorite machine. The chair swivels from one to the other. 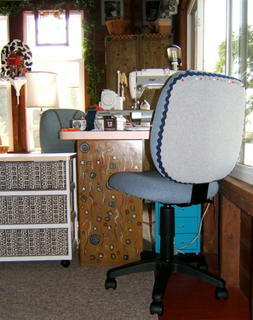 Previously it seemed that the machine I needed at the moment was NOT the one that was set up on the sewing desk. Whew! Glad that problem is solved. Every inch is planned for storage and particular tasks. When I reorganized a year ago, I took the doors off the storage cabinets and way too many books out of the bookcases. My friends and the local library benefited from that task. Now most of my fabric stash is visible. My philosophy is, " If I can't see it, I don't have it". The silks, wools, etc. are in clear storage boxes stacked under the cutting table and sewing desk. I don't use those often, but I can still see and get at them. The futon is my major "designing tool". I lay there studying whatever piece is on the design board. It's amazing what can be seen or realized in those moments of waking up or falling to sleep. Although, I'm thinking of replacing the futon with a stratalounger chair so there will be space to set up a table area just for fabric painting. 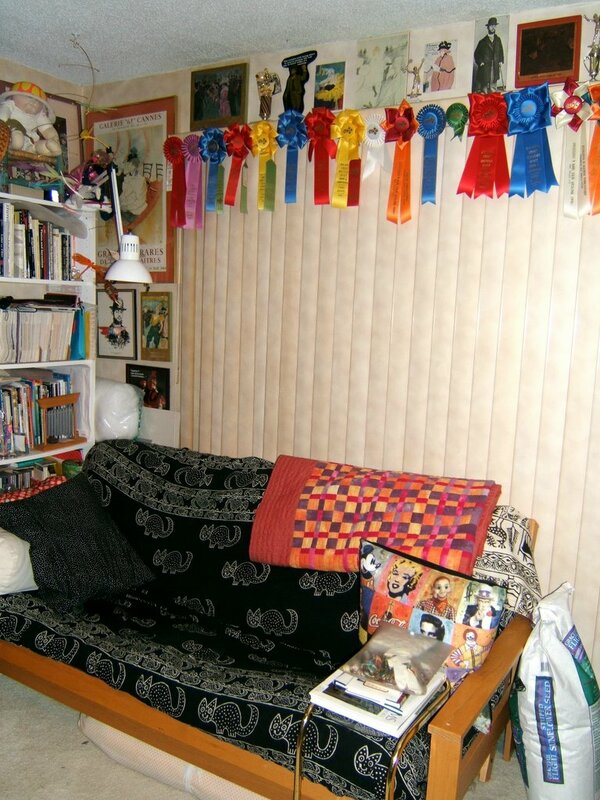 And yes, that's a lot of ribbons. 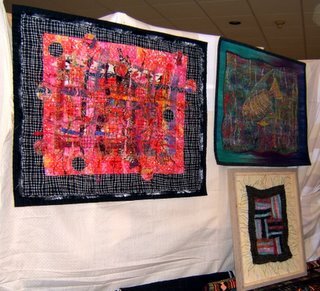 Most all of them were awarded to entries in Knoxville's Dogwood Arts Quilt Show. 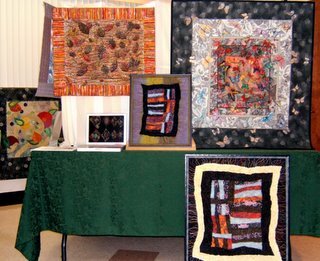 That's the one competition I've entered yearly since I began quilting in 1994 as a measuring stick of my work. It's a judged show and doesn't require slides ... a big plus in my book. There are many entries from around the USA and a few from foreign countries as well. I figure if I can compete well in this show, I've "still got it". The design wall is 1/2" fiber board from building supplies at Home Depot. It's covered with felt-like material especially designed for this purpose ... fabric clings to it. If I ever recover it, a medium value gray felt will be my choice. 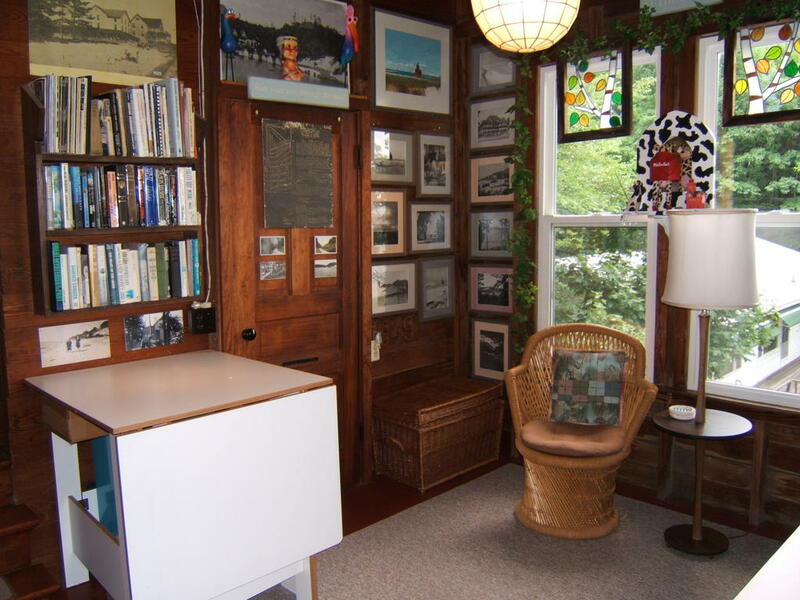 The long cabinet/counter beneath it is a bookcase laid on its side. It had been upright across the room and full of books. The dividers are closet organizers I bought from Target. Don't know where I'd put that printer if the narrow counter top weren't there. This set-up cut down on the area of the design wall, but the counter sure is handy. I use the step-ladder often to work at the wall. 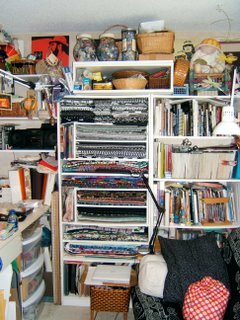 There's another tower of shelves that stores threads of all kinds on the right side of the design wall to complete the room. Summer is definitely over. 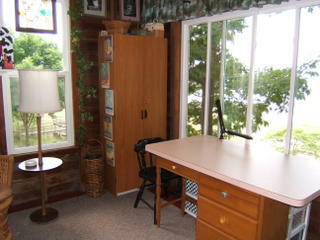 It's time to close up my studio here at the cottage in Michigan and move to Studio South in Tennessee. 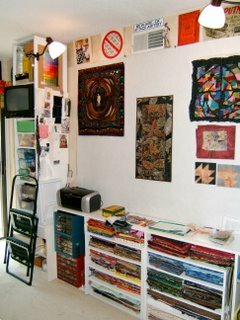 This summer studio is small (11'x10'). When I'm not here it needs to look like a general project/office/reading room. I had spent quite a bit of time reorganizing it at the beginning of the summer. 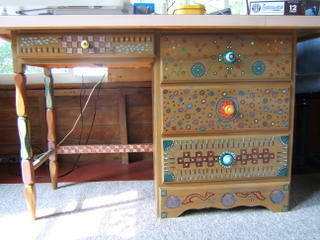 In August my friend, Alicia, helped me paint the desk and storage cabinet. 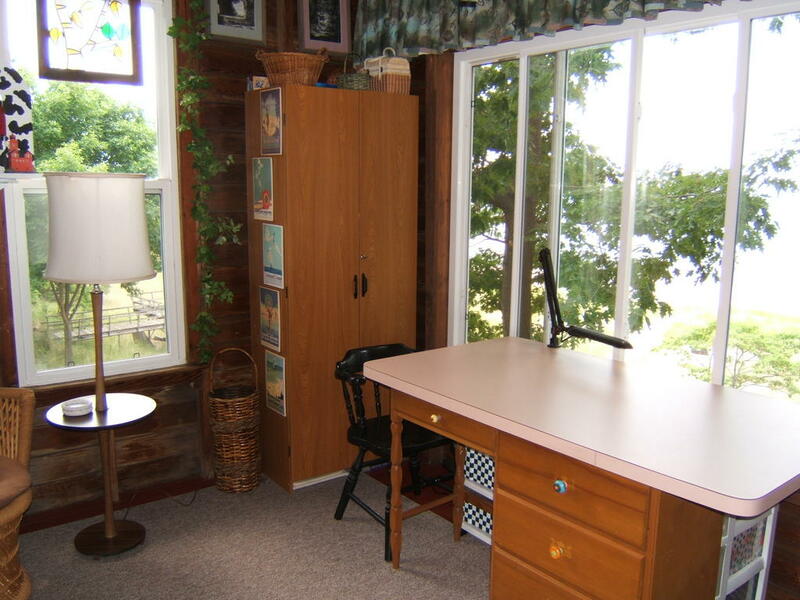 I love the big pink formica top on top of the desk. It accomodates both of my sewing machines very nicely. 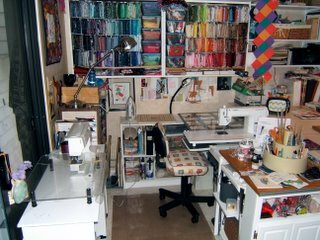 I use my old Pfaff 360 for piecing, sewing on bindings and any zig-zag stitching (usually couching yarns). 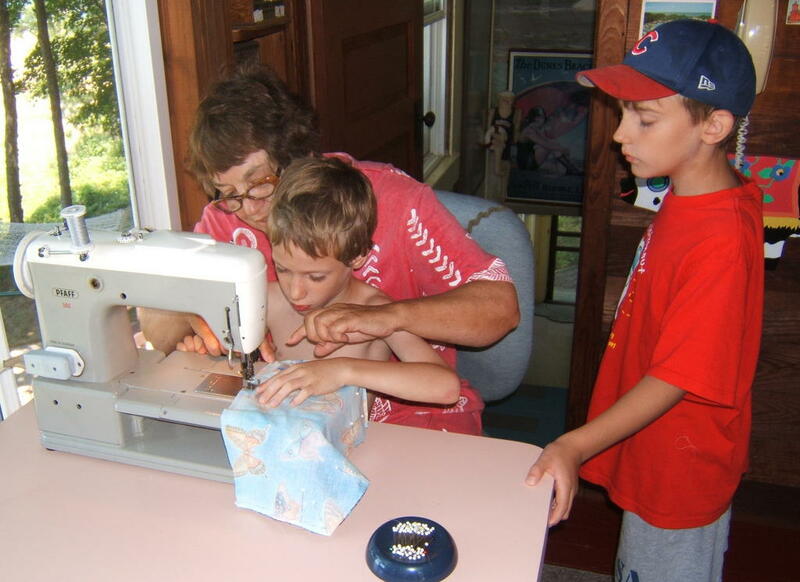 The Brother 1500s is mainly used for free-motion quilting. I share this studio with anyone who comes to the cottage. 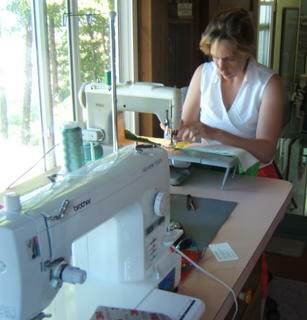 In the above photo Diane Durand is applying a binding to one of her creations. Even my grandsons get to sew. Winston is waiting his turn while Jackson is making a "super cape" for his stuffed dolphin. Jennings was waiting out of the picture. The view out the huge picture window can't be beat. Plus there's the wall of windows to the left of the supply cabinet. The rolling storage table serves as an extra surface. There is another one under the cutting table. Both contain most of the fabrics I keep at the cottage. 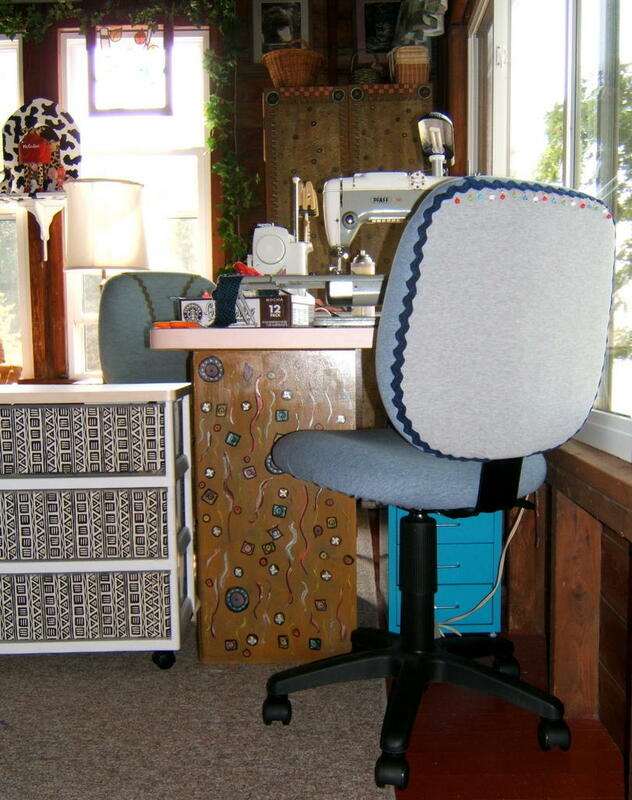 The turquoise rolling cabinet stored under the sewing table contains my daughter-in-law Jeanette's sewing supplies. Well, it's time to dismantle my design wall. The covered fiber board panels hang on hooks over the photos on the wall and on the back of the door. I have a large piece of suede upholstery fabric that can be pinned across both boards when a large piece is being worked on. My next posting will come from Studio South. 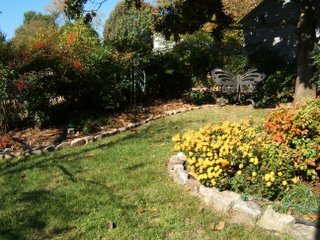 Daisies are one of last flowers blooming in our cottage garden. 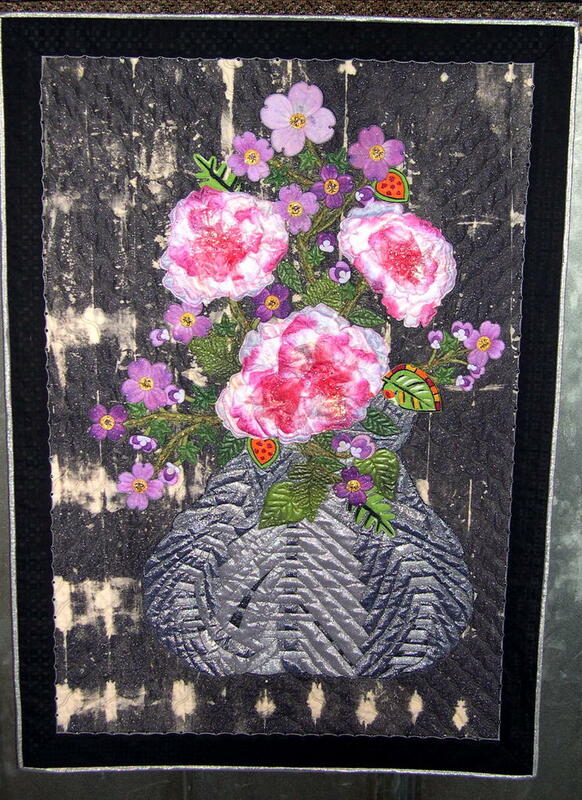 I was inspired to make a small wall quilt featuring this flower by an annecdote related to me by the woman who was treating me to a reflexology massage and a gift of fabric remnants from an interior decorator friend. I Really Wanted Daisies 13"x10"
In the middle of a massage session the image of daisies popped into my head. So I asked Carol, the reflexologist, "What is your favorite flower?" Her reply was, "Daisies." She went on to tell me the story of her wedding. "I had wanted to carry them at my wedding, but my family who owns a greenhouse and nursery said I could not carry daisies ... to leave the flower decision to them. So, I carried a bouquet of gardenias and I hated them. I really wanted daisies." 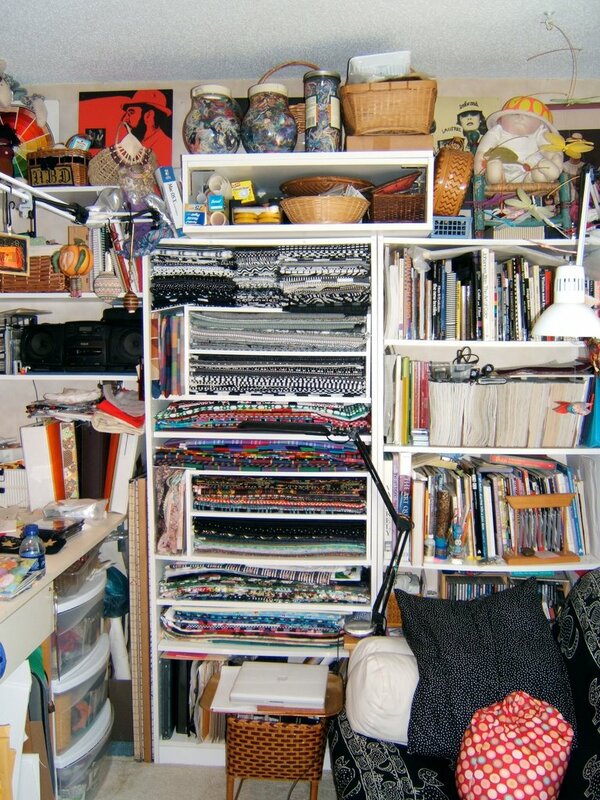 This converstaion had happened the day before another friend, Ebbie, gave me a big bag of decorator fabric remnants. 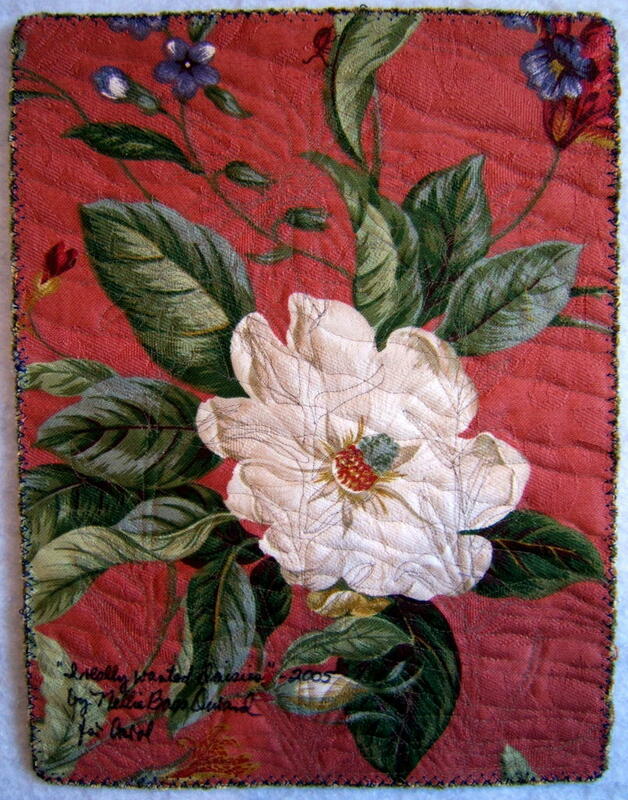 When I unpacked it and saw the one with flowers that could pass as gardenias (though they're most likely magnolias), I knew I had to make this quilted wall hanging for Carol. I have my last session with her this week and will give it to her then. Yeah! 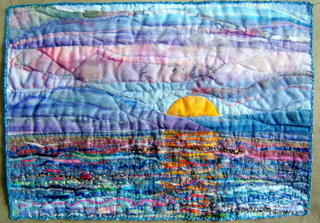 My crinkle quilts have found a gallery. 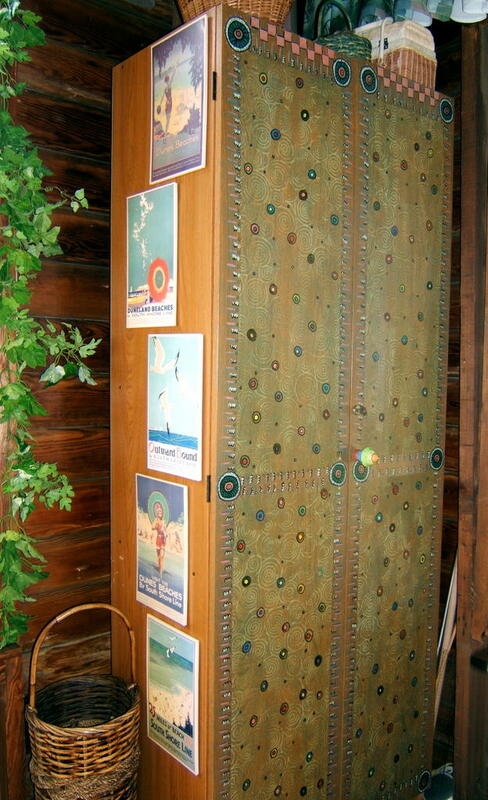 Good Goods is located in Saugatuck, Michigan. It's Lee's and my favorite shop and gallery in this part of the country. Check out their website and you'll see why. 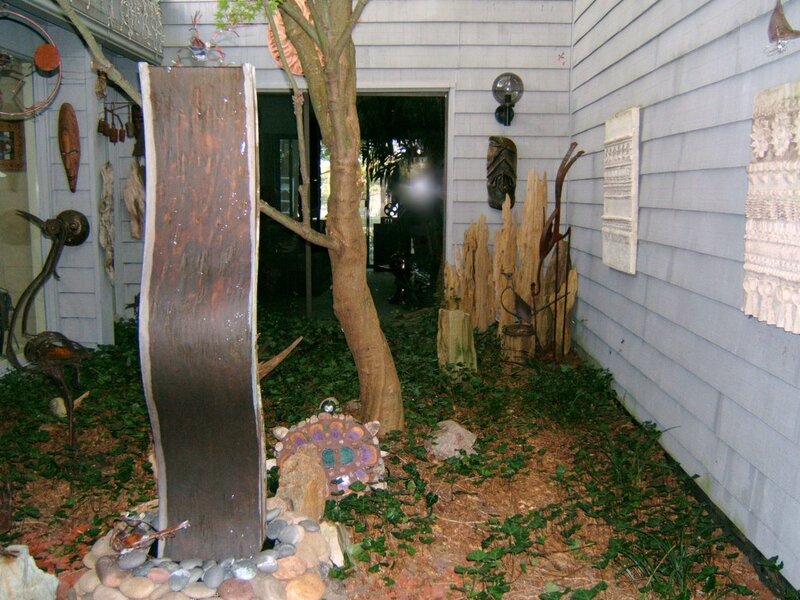 There are sculptures and many art pieces here at our cottage and our condo in Tennessee that come from place filled with wonderful art and objects. The foundation is patchwork pieced with a nod to the traditional "log cabin" quilt pattern. 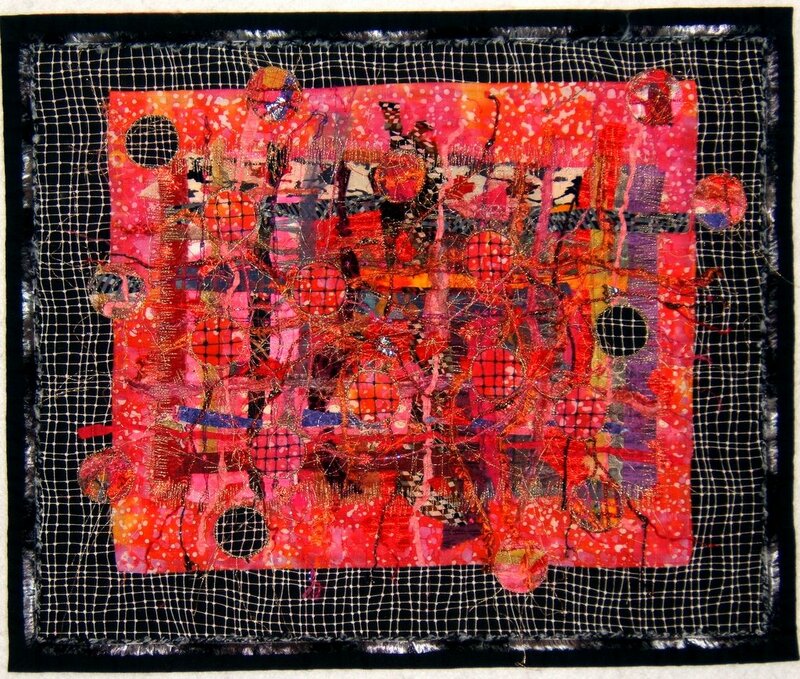 "Wild By Design" - 21"x 23"
The foundation is patchwork squares of commercial and hand-painted fabrics. "Crinkle quilting" is a technique I developed. It involves setting wrinkles into the surface fabric. This wrinkled fabric is layered with batting and a flat backing fabric. 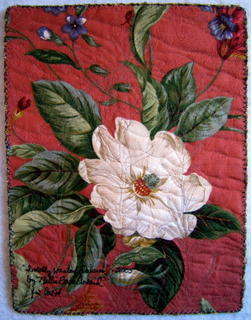 Hand-quilting between the wrinkles with two-ply strands of cotton floss creates the "crinkled" texture. The threads that frame the piece are the beginning and ends of my stitching lines. 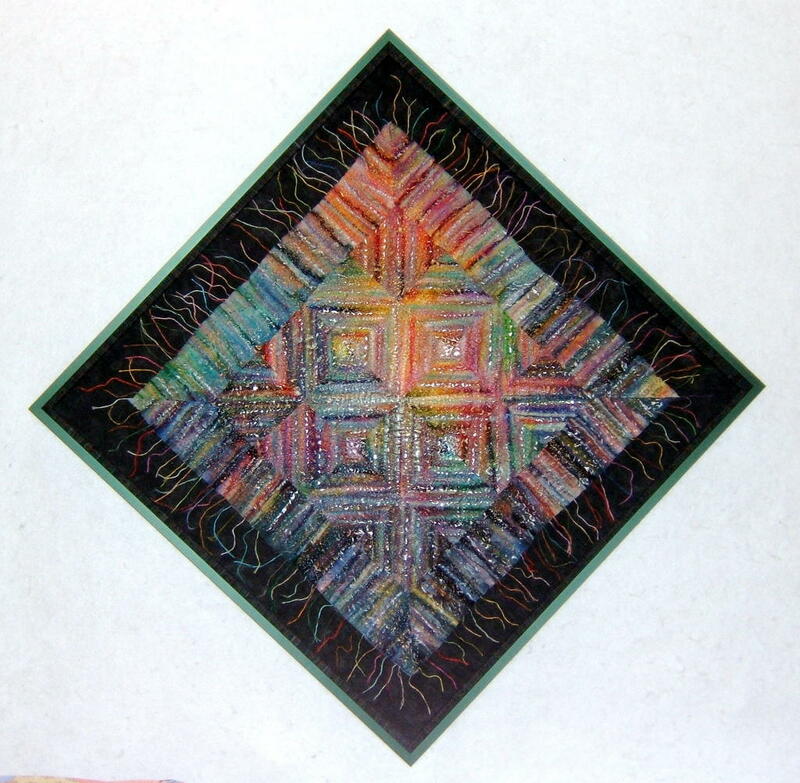 Paint and pastels are applied to emphasis, mask, or accent elements within the compostion. 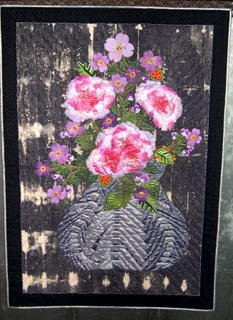 An acrylic matt medium is applied as a finish to protect the quilted surface. 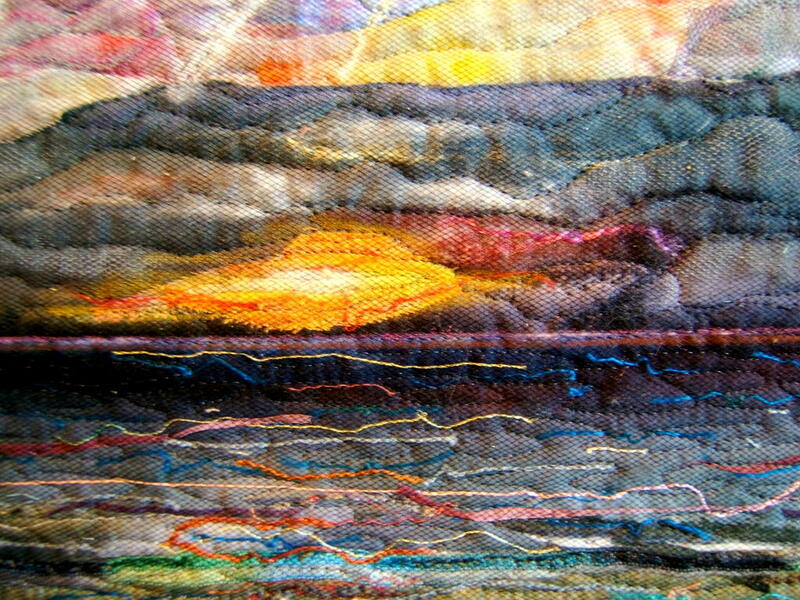 As I had previously written, I wasn't finished with sunsets. I had fun making two more. Just had to make a "big red ball" one. 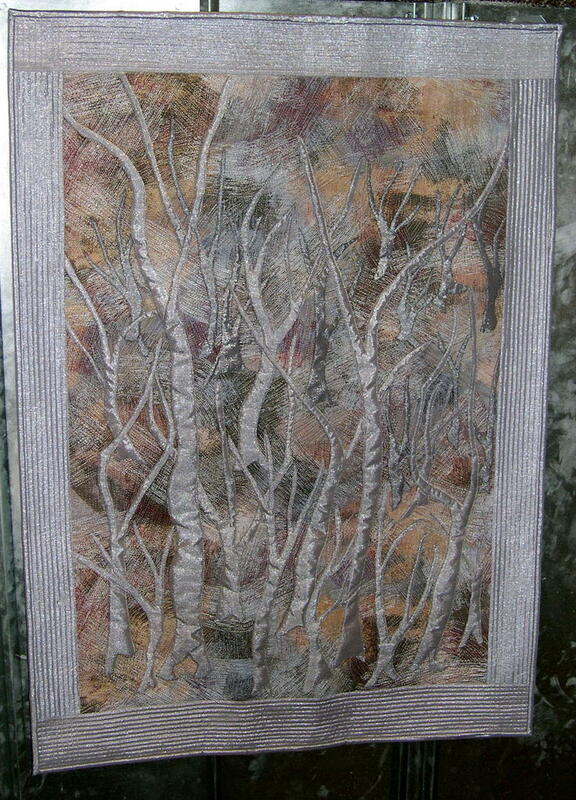 It is 12"x 8". We've been seeing quite a few of these lately. 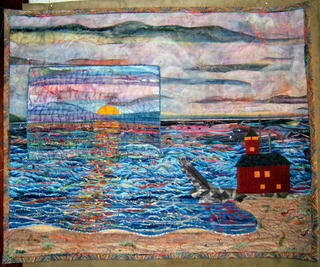 I just had to make one that didn't have a big ball of a sun setting into Lake Michigan. 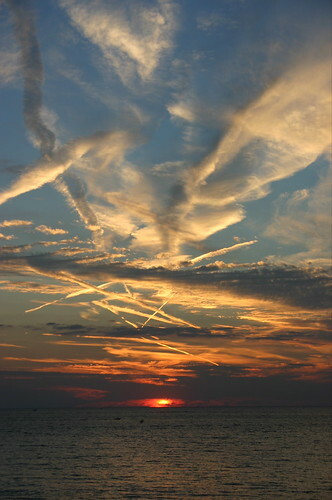 Also there are times that we see many contrails from jet traffic. I was inspired to take this direction by a photo taken by my nephew, Peter Durand, when he visited with his family (Diane and Lilli) in August. A photographer friend, Morley Johnson, forwarded to me a most interesting newsletter. It's posted as "the most comprehensive (free) resource for artists worldwide" and is written twice weekly by Robert Genn. The subject of the one Morley sent is titled "Delicious Cropping". It is suggested that finished work be cropped to find interesting sections within it. 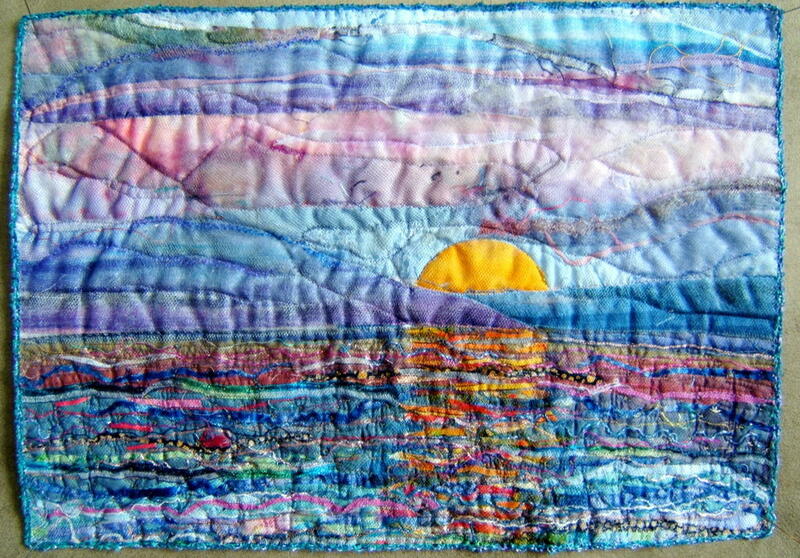 Here's the mini sunset piece overlaying the larger work (30"x24"). It looks almost seamless even though I did not refer to the larger one while making it. Mr. Genn states that by cropping a finished piece "an artist can understand more about his or her personal style, mannerisms and "signature." As well as having a compositional diagnostic, you enter the informative world of the "post-creative revised aspect." He goes on to say, "You'll surprise yourself at how delicious some areas are--how you were on top of your form or in control. You might just surprise yourself with hitherto unnoticed spots of beauty, as well as mysterious flashes of energy that you didn't know were there. You'll also discover how a conceived composition is often not as interesting as are some of its isolated parts." If this piece had not been a present to my son, I would've been sorely tempted to cut it up. As it turns out, it was a joy to create this delightful little piece and I intend to make at least one, or maybe two more. "English Yellow #2" (24"x 24") hangs on our wall in Knoxville. Mentoring, or encourageing creativeness as well as sharing knowledge and skills, is an important element in my creative life. I'm fortunate to have a number of people who welcome my imput, although there are occasions when maybe it's perceived as intrusion. Even then, I like to think that it's a possitive experience on both ends. I'd like to share the most recent accomplishments of two young women artists who are close to my heart. I feel privileged to share experiences, resources, and supplies as well as the name "Durand". Untamable Fire is a psychological landscape. The elegant beauty of our conscience is thrown into a tidal wave of flames. We strive to build an ordered and calm world, but nature has other plans for us. Chaos consumes our structures and replaces them with native landscapes once again. 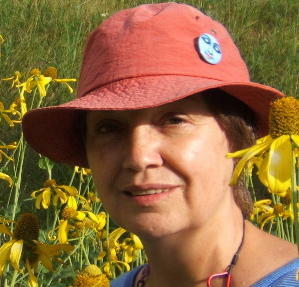 VISIT Jeanette's site and blog. She'll be writing about her experience soon. Her website is Embellished Visions (link is listed in the column to the right). Diane Cross Durand is my neice-in-law. She and her family (husband, Peter, and 18 mo. old daughter, Lilli) left the cottage here at Macatawa this morning after a 10 day visit. 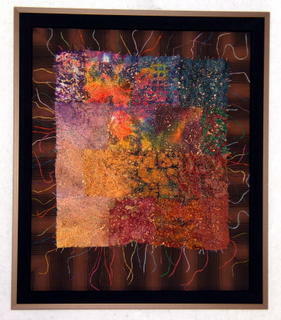 During this time she "discovered" a technique that translates her style of drawing into fiber art. Diane designed and completed two pieces. Each looks like they are drawings straight from one of her journals. Diane sewing the binding on the last evening. 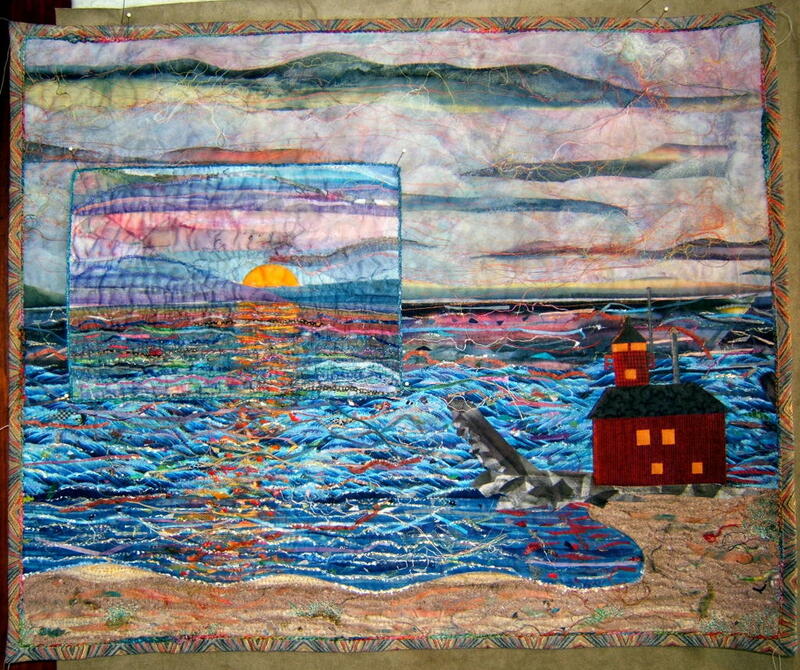 I was so pleased to get the news today that our guild, The Smoky Mountain Quilters, won the Grand Champion award in the Ultimate Challenge contest at the American Quilter's Society Show in Nashville, Tn. The prize is $5000 which goes into our guild's treasury. The Ultimate Challenge entry from the SMQ comprised eight quilts selected from many quilts made by our members that featured a challenge presented by our guild. This year's theme was a commemoration of our guild's 25th anniversary. The quilts were made to a specific size, featured 25 of "something" and was to incorporate a silver cotton lame fabric. 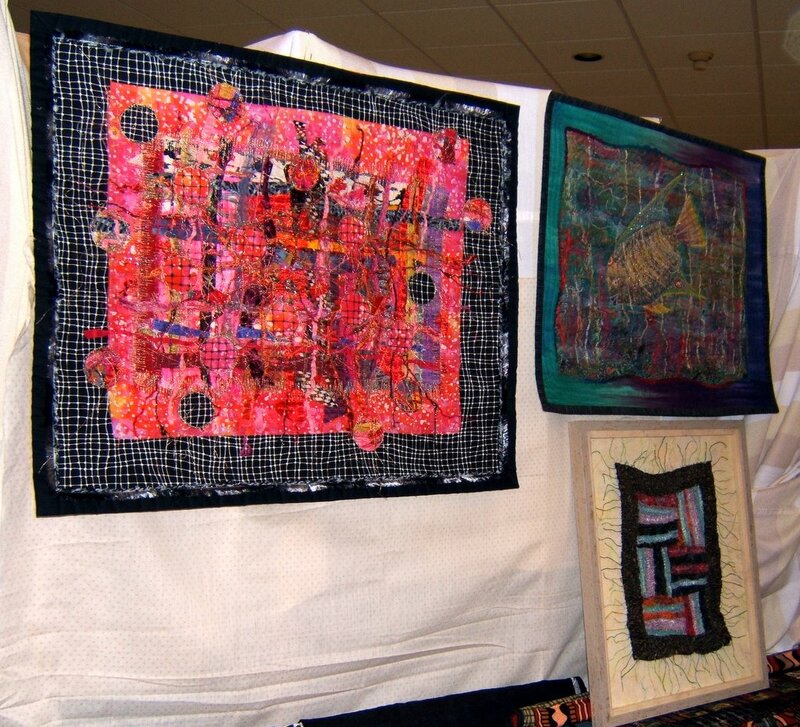 Here are photos of the quilts that won this top award in that prestigious show. Jan Borkowsky - The names of all 25 chairwomen of the Dogwood Arts Festival Quilt shows are written on the saucers. There are 25 napkins, candles, and plates. 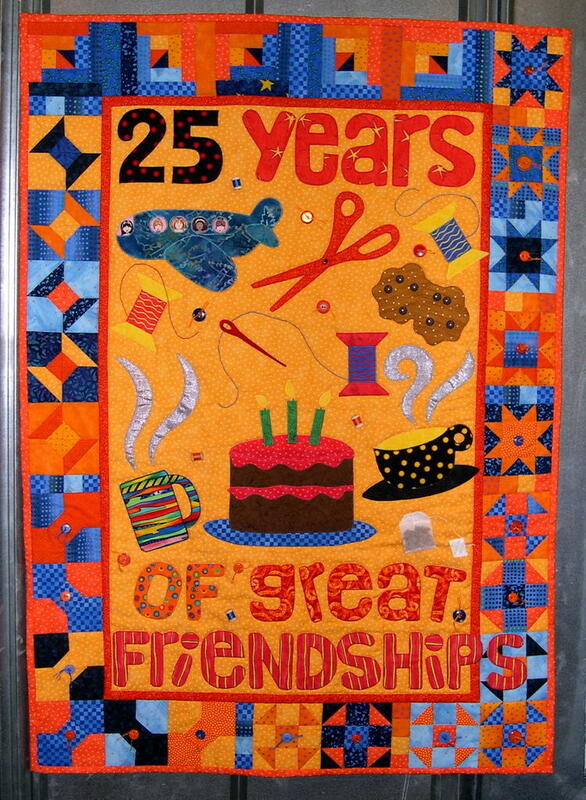 Pat Blankenship - "Twenty-five Something" - Features events and happenings among guild members. Gayle Loundes - "Reaching For the Sky - Twenty-five Years and Still Growing Strong" - there are 25 trees. 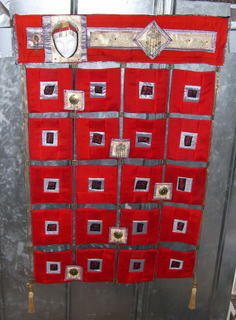 Barbara Lopes - "25 Scarlet Beads" Made from kimono silk fabrics. Bridget Wilson Matlock - Anniversary Bouquet. 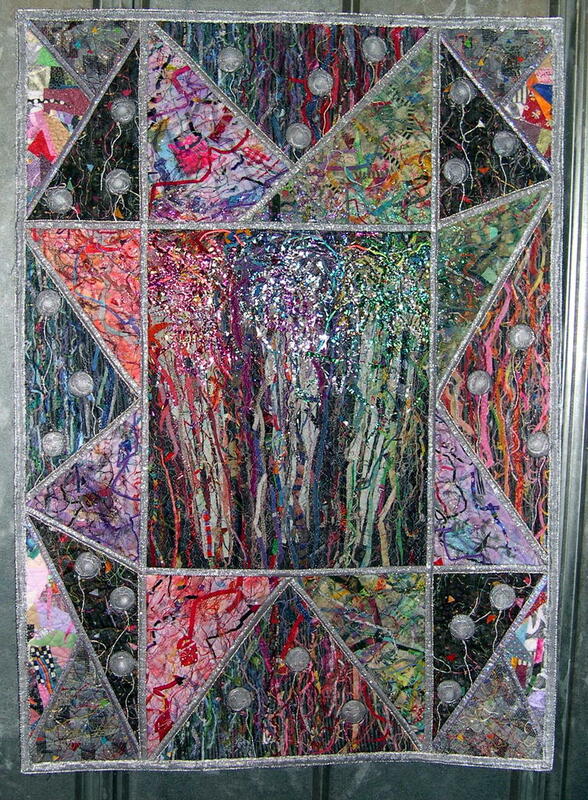 Pat Davis - "Ode to a Midsummer's Night Dream"
Gloria Felter - "Stars of the Smoky Mountains"
Nellie Durand - "Celebration" - There are 25 pieces making up the design. I incorporated all the different ways I could think of to celebrate ... fireworks, a big silver outlined star, a balloon release, confetti, and a ticker tape parade. 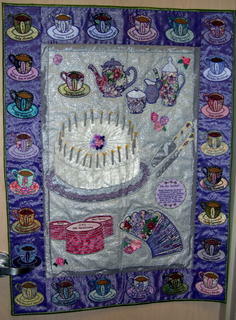 The Smoky Mountain Quilters Guild has entered this contest twice before. 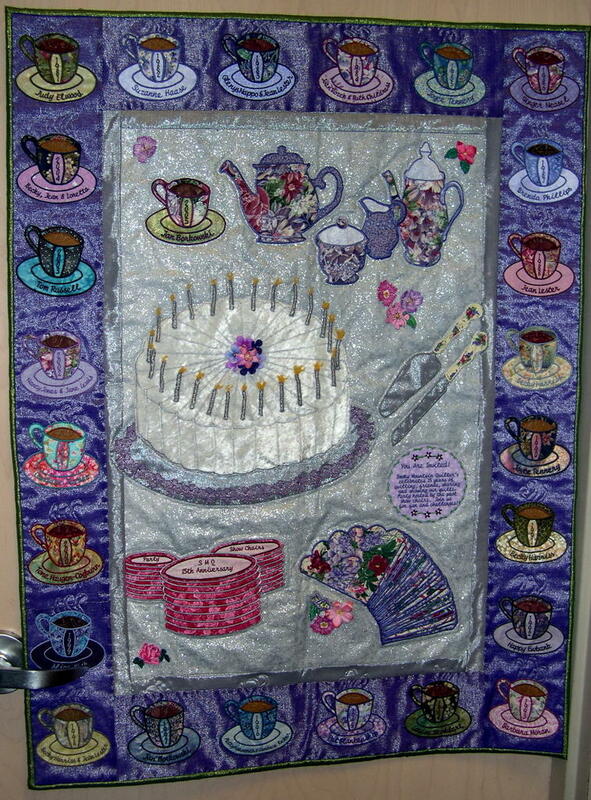 In 2003 our challenge theme was "T" and we won second place (my contribution was "May Day Teaparty"). In 2004 the theme was "Yard" and we placed third ("Junkyard Dawg" was the one from me. My medium consist of the techniques and materials tradionally used by women to provide clothing for their families and items for their homes. 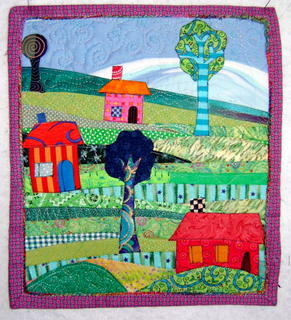 I utilize many types of stitchery and sewing skills to contruct my pieces from new as well as recycled fabric, threads, and yarns of all kinds. I also use findings, sewing notions, fabric paints and dyes, as well as oil pastels. Craftsmanship is an important element of my work. 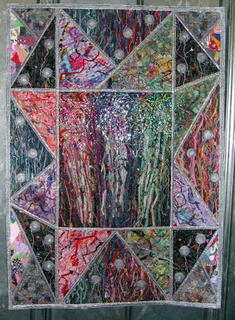 However, exploring the interplay of colors, values, textures, materials, and techniques is my passion. Professionally, I have taught stitchery techniques, as well as color and design, through classes for organizations and needlework shops across the United States and Canada. 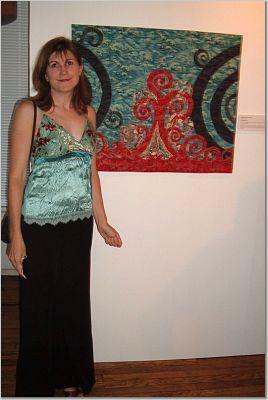 My work has won recognition in juried, judged, and invitational exhibits. It's finally finished except for a bit of handsewing on the binding ... and a hanging sleeve. It feels so good to create the first piece of art this summer. It's been a series of settling in here at the cottage. First time when we arrived in late May, then neutralizing the cottage for the renters, finally getting it all back to how I like it ... again ... when we returned from Colorado. Plus, there's the time it took to reorganize and paint the furniture here in Studio North. Alas, now I feel in the "groove" and comfortable in my space. "Big Red at Sunset" 30"x24"